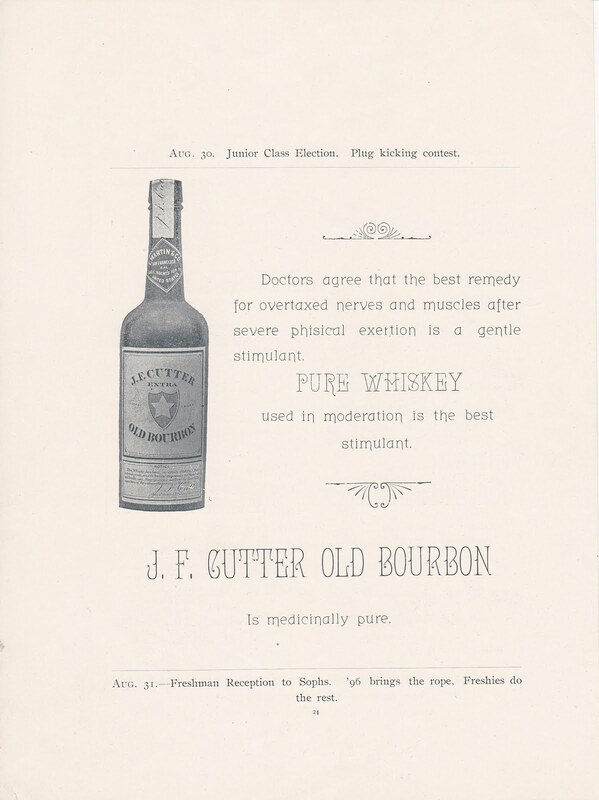 Actually, the commercial says "V8" but in this case, I think a shot of J. F. Cutter makes more sense. After all, more Doctors recommended J. F. than any other leading brand. At least that's what the advertisement suggests. The rest of the day was a kick; spending time with lots of old friends, picking up the whiskey collection that we'd bought the week before, boxing up a few fresh pieces, delivering stuff that had been purchased over the past month, and enjoying ourselves in general. But the redness and itching were getting the best of me. That evening after setup, we checked in at the Silver Legacy ; another perennial favorite. Uh Oh... we'd left the satchel with our change of clothes on the counter at home. Crap... Oh well, a good excuse for my wife to go shopping (as if she's ever needed one)~ But wait, there's more, another surprise; my green glop Cutter for the shootout was in the box next to the satchel, on the kitchen counter. Oh well, it's safe there. Saturday AM came early. It was then that I noticed the swelling. It was a chore to put my tennis shoes on and lacing them up tight wasn't an option. And then there was the itching; head to toe, inside and out. But heh, this is the Reno Show and I was determined to enjoy myself, hives, swelling and all. The displays were amazing. Lou and Marty are both to be congratulated on the Star Shield globby display. Photos were in order! Oh Crap; my camera was still on the counter, next to my green Star Shield, which was next to the clothes. A Silva trifecta! Next to the Cutter display, was a killer arrangement of "dirty clothes"; at least that was my wife's assessment. Personally, I found the display of miners clothing and personal effects to be fascinating as well. A display of amazing inks and Marty's to die for "swirly" display of drop dead bottles with barber pole color swirls rounded out the west wall attractions. Check out the glop top site for photos! Back at the hotel that evening, truck loaded with bottles and ready to head back north, the hives, the itching, the swelling were all beginning to take a toll on my fun ticket. We'd planned on a few side trips before the drive home on Sunday. Problem was, I couldn't get my shoes on. My feet looked like they belonged to Fred Flintstone. So much for exploring. Five hours later, we rolled down the gravel drive at home. The next morning, with eyes swelled shut, difficulty in swallowing, hives, blisters & itching, the retired firefighter / EMT in me sprang back to life. Denial only works for so long. I had a problem, a big problem! A mad dash to Providence Hospital / Medical Center was in order. Diagnosis; acute allergic reaction. Thanks Doc.! So much for modern medicine! Out of pocket about a grand (I've got lousy insurance with a massive deductable), I'm sitting here gobbling prescription steroids and antihistamines by the handful to help cure the effects of the previous two prescriptions. Something's wrong, very wrong, with this picture. And so, I ponder, is it true that more Doctors agree that the best remedy for over taxed nerves is a gentle stimulant by the name of J. F. Cutter Whiskey? Sure beats the heck out of a near lethal combination of Amoxy/Clavil and Allopurinol! And, if the Doc screwed up on the J. F. prescription, you'd only be out a buck or so for the whiskey and the worst you'd end up with is a hangover! No, not the fast food joint; although Arby's is half way decent in the grand scheme of "grab and go" chow. I'm actually referring to R. B. Hayden, a brand of bourbon distributed by Barner & Kehlenbech. 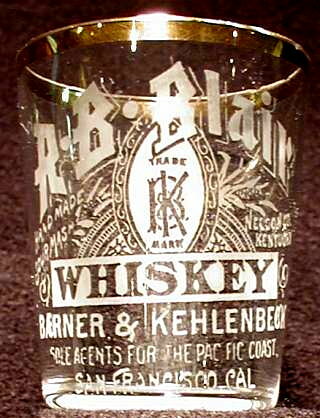 Their cylinders are embossed Barner & Kehlenbech / large intertwined logo / San Francisco, Cal. and are always tooled. They come in shades of amber and were blown with either a long tapered collar over single ring or with a Riley patent inside thread closure, which is scarcer. The cylinders were used first. Later on, probably in the mid teens, an amber rectangular full quart tanker appeared. It's actually pretty darned rare and I've never even seen one. Seems that they liked the initials RB, since both of their flagship brands started with them. R.B. Hayden and R.B. Blair were the two that they pushed the hardest. 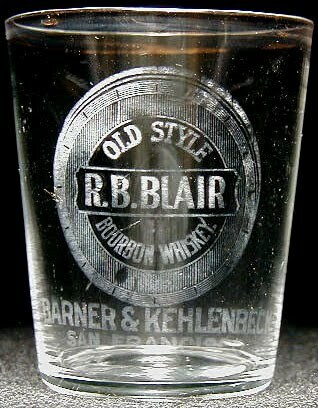 There's three etched pre-pro glasses for R.B. 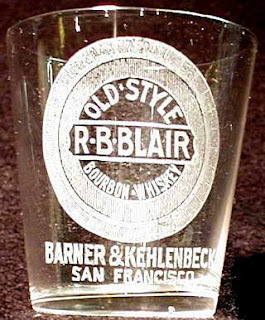 Blair and one for R. B. Hayden known to exist. 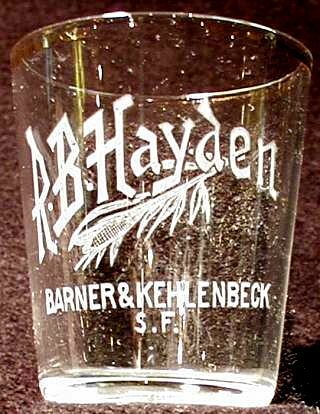 And, there's one extremely scarce white enameled back bar out there for Hayden as well. The pattern on the back bar is a dead match for the glass. Enameled bar bottles are inherently rare. They were designed to be the focal point of the back bar, were splashy and intended to be used and reused on a permanent basis. They were expensive to produce compared to their embossed "throw away" counterparts and as such were almost never discarded until inadvertently broken, or until such time as the brand or the business failed. The elaborate patterns and artistic features of this style of bottle make them highly sought after and the competition for them is keen. Now back to B&K. Up until now, not a great deal was known about Barner and Kehlenbech, despite the fact that they were relative newcomers to the game. Today's research revealed a lot of heretofore unknown locations and information. Wilson states that the partners were Wm. Barner. and Henry Kehlenbeck. He was wrong. The partners were actually Louis H. Barner and Henry Kehlenbeck. Although dated from 1910 to 1918 in Western Whiskey Bottles 4th edition, they actually got their start in 1898 at the S.W. Corner of 8th and Mission. They moved to 324 Clay St. in 1900, where they remained until the site ended up in ashes on April 18, 1906. The May 12, 1906 phone directory does not list them, indicating that they had been displaced along with tens of thousands of others who'd lost their homes and businesses. A third edition post earthquake temporary directory of S.F. and Oakland dated June 20, 1907 shows them at 1801 Devisidaro at the corner of Bush, with a phone number of West 3756. Crocker Langley shows the business moving to 714 Kearny St. in late 1907. It also shows the current principals in the business as being Mrs. A. Barner and Mr. H. Keltenbeck. Later, in the 1915 directory, Mrs. A. Barner's name changed to Mrs. A. Anderson; an obvious clue to a remarriage subsequent to Louis's death. The Kearny St. location remained constant, housing the firm for another twelve years, where they remained until prohibition shut them down in 1919. Thanks to Robin Preston for the generous use of the shot photos. I have appreciated the opportunity of serving as your Western Region Director of the FOHBC for the last two years. I believe that the FOHBC should be focusing on services and support to help the bottle collecting community. 1. Gathered information and updated a listing of the Western Region Clubs and Shows. This information has been distributed to the membership and the clubs in out region. 2. Served as Chairman of a committee to prepare guidelines and standards for Hall of Fame and Honor Roll nominees and inductees. This was passed at the March meeting of FOBHC in Baltimore and has been distributed to the Western Region memberships and clubs. 3. Served as chairman of a Committee to update and revise the FOHBC Bylaws. This document is still under review and hopefully will be completed in the near future. 4. Served as Chairman of the FOHBC Nominating Committee for a Recommended Slate of Officers and Directors for next two-year term. A slate was selected for the election which will enable the Board to run smoothly and better serve the needs of the collecting community. Several current Board members were not included nor recommended in this slate by the Nominating Committee because of ongoing issues with their actions and performance as Board members. A letter to the editor from Jim Bender in the July ABGC, and the President’s Message in the July-August Bottles and Extra magazine, summarizes these issues. You may want to read these before voting. Over the last two years, under Richard Siri’s presidency we have worked to get the Bottles and Extra magazine current, bring the website up to date, complete documentation of income and expenses from the York and Collinsville Conventions, update and create needed written procedures, and get locations set for future FOHBC Conventions. The Board is also now evaluating the concept of a virtual (computer access) bottle museum. In the future, I would also like the Board to work toward establishing uniform nomenclature for bottle condition and color to provide a universal language for auction houses to adopt, and collectors to utilize. Another issue for the Board to work in support of protection of the bottle digging aspects of bottle collecting. There is a lot more that needs to be done and I would appreciate your vote so that I may continue on these projects. Your FOHBC ballot also lists the Recommended Slate for the Board which includes Richard Siri for President and Warren Friedrich for Secretary. Your support and your vote for these nominees would be greatly appreciated. We need to get the whole Board working for the benefit of the bottle collecting community. I've been given an opportunity on this blogsite to address members of the Federation of Historical Bottle Collectors. An election of new officers for the next 2 year term is in progress as I write this. I would urge all current members to please take this vote seriously, and I would recommend the candidates that have the FOHBC endorsement by their name. I have been a member for almost 4 years now and have seen several improvements of this organization since joining. I am currently running for the position of Secretary, partly to help assist with the other western board members continue to achieve changes to the Federation that are needed and to direct this organization to do what is best for its membership, afterall this organization serves for the benefit of its members [or should! ], and to effectively make the necessary changes, some of the current board members need to be unseated. One of the changes I would like to see is the addition of more articles on ANTIQUE BOTTLES of western origin or distribution in the Federation's magazine. I recently co-authored an article which appeared in the May-June issue on the Lacour's Sarsapariphere Bitters and its proprietor. I have plans to submit several more interesting articles on other western bottles in the Federation's magazine. Other board members running for re-election are Richard Siri and Bill Ham, I can tell you that without these two members it's most likely that the upcoming Antique Bottle Exposition scheduled to be in the West in 2012 would probably not have materialized. There was opposition from other current board members against it and had our west coast board members not continued to support this, it most likely would be held in the Northeast region of the country. We have NOT had an Exposition really in the West since Las Vegas in 1988. That's 24 years ago! When I joined the FOHBC I was not receiving the organization's magazine, actually I was due several issues at the time of renewal! The magazine, thanks to our current president has gotten it back on track. I am also excited about the bottle Exposition coming to Reno, NV in 2012! The 2006 National Federation show was a huge success at 267 tables, just imagine what a Expo show will have. I would like the opportunity to work with the other western board members in order to continue to make improvements to the FOHBC and to contribute to the magazine's content and keep the membership informed of what YOUR organization is doing by reporting what is happening at the Board level. Again please consider voting for the candidates that are FOHBC recommended on your voting ballot. Don't forget, the cutoff date for the Federation of Historical Bottle Clubs (FOHBC) elections is fast approaching. Everyone knows that emotions are running high and that the candidates running for office are pulling out all the stops; some by citing their past accomplishments and plans for the future, others by resorting to more "conventional political means". Bottom line; If you don't have an opinion, study up and form one. Then vote for whomever you think is most qualified based on that opinion. It's our Federation and it needs to continue to support and promote our hobby! In Search of the Lost "H"
Four of us, with more ambition than sense, have decided to push forward in an attempt to determine just who was responsible for the "H" base mark present on a number of post turn of the century tool top western whiskies. Following, please note a database that we've assembled listing bottles and "H" base marks. We know it's not complete. Please email me with what else you've got in your collections so that we can continue to push forward in either ruling out, or pinning down the source of the "lost H". In the mid to late teens, toward the end of a long, successful run, the liquor industry on the west coast began to loose it's spark. The days of ornate picture whiskies were over and the days of glop tops were already a distant memory. More was better and cylinder fifths were being replaced increasingly with full quart rectangles. Gone too, was the age of innocence and consumers were now assured of the purity of their product thanks to the wording on the label that read "guaranteed by (name of wholesaler) under the Pure Food and Drug Act of June 30, 1906". So, the logger, the miner, the laborer and anyone else with a taste for whiskey, could now indulge with a safe supersized container of their favorite brand. Good for them, but bad for us aficionados of their empties. Face it, the plain, ungainly looking full quart rectangle just didn't have the grace of a slender cylinder fifth. Not to mention that most of the embossing was, well, just plain boring. For the most part, gone were the ornate logos and pictures were as extinct as the dinosaurs. Well, that's true for the most part. But, nearly all of the tankers also had a paper label on the reverse side - opposite the embossing, and that's where the pizzazz gets lost to time. Sadly, the glass has outlived the paper labels well over 99% of the time. And that's were collecting the tankers gets interesting. It's also where a few of the mysteries get cleared up. We'll look at a few this time around. Let's start with Hawkins Rye, not much to look at normally. Aqua, with a simple name embossed inside a circle, "Full Quart" on the reverse shoulder, a funky step inside of the tooled cork type top, and nearly all of the time without a label. So just what was Hawkins Rye? Well the Snyder database says that it was a product bottled by McDonald & Cohn of S.F. I'll buy that; it's a matter of record that they registered the brand along with a bunch of others, somewhere between 1903 - 1911, when they tossed in the chips. Enter a labeled example. But wait, it reads Guaranteed by Levaggi Company. Huh? According to the records, they only sold Claremont AAA and Royal Life. Well trust me, labels don't lie and since I scored this one out of a basement in the Montague California area, where it had been since the contents were sucked dry, I know it's the real deal. And, actually, it make sense since Levaggi picked up steam, (they dated ca. 1907 - 1919), about the time that McD & C were loosing it. That's another great thing about labels; they help narrow down time frames; in this case from 1911 - 1919. Another item generally relegated to entry level collector status is the Lawton Rye made by Roth & Co. Rightfully so, it's about as common as a chicken beak. And not much to look at; until you come across one with a label. Roth trademarked both Lawton and Lawton's toward the end of their marathon wholesale liquor stint, which ran from 1858 - 1919. Hell, they'd probably still be around if the Feds hadn't stuck a fork in them. This particular example is both embossed and labeled for Lawton (singular - not possessive) Rye. It still sports the correct embossed Riley IT stopper, remnants of the neck label, which matches the main body label and shoulder seal. The graphics are a real treat! Also unusual about this specific bottle is that it has the "Union Made" seal embossed on the shoulder. The multi colored label has great graphics and the neck band reinforces the integrity of the product, boldly stating "Purity". Hanley Mercantile had a pretty cagey merchandising ploy. Oregon enacted "local option" in 1904, whereby many counties went dry. Prohibition hit the state in general in 1914, well before the rest of the nation in 1920. So, Hanley Mercantile merchandised heavily "up north" and did a land office mail order business via the Southern Pacific. Send them five bucks, and they would forward you four bottles of Hanley Rye in a "plain brown wrapper" on a future northbound freight. Increased business for them and no one need be the wiser in Oregon; necessity was, and is, the mother of invention. This particular critter came from the same place down out of Montague and obviously never quite made it north of the border. Hanley Rye; again neat graphics, and the correct hard rubber Riley IT stopper. Larry (or Larry's) Whiskey. Another brand of rye. Incidentally, rye whiskey was almost unheard of prior to the turn of the century but the fad really caught on around 1910. It must have fallen back into disfavor with the whiskey drinkers because I don't recall ever seeing it on the shelves these days. Larry was a brand of Wilmerding, Lowe & Co. and is a real late product in terms of their lines. It dates ca. 1912 - 1915 and must have not been a good seller since they never registered the brand and they are considered rare by tanker standards. Old Judge! I saved what I consider the best for last. Common as dirt and late (1907 - 1915); the bottle is nothing to get excited about. It's a corker so not even a fancy embossed rubber stopper. But, add a label with these graphics and I'm drooling like a teenager spying on a Sports Illustrated swimsuit shoot. Sure, a little tattering and some minor label loss is present, but try to find another one. And then there's the label proper; slightly raised patterns with a floral border, multi color graphics and "Da Judge" replete with a shot glass full in hand - pinky finger elegantly extended in anticipation of savoring the goods. Your honor, sir, could you pour me one too? Tough to improve on the overall draw that this one's got! The firm of Carroll & Carroll dates back to 1859. John Carroll established a fledgling wholesale liquor house @ 50 N. 1sr St. in S.F. The business grew, and in early 1860, John took on his son Richard T. (R.T.) Carroll as book-keeper. 1869 saw R.T. functioning in the capacity of full partner. In 1870 Richard T. entered into a partnership with Richard Brainerd, and the firm was launched as Carroll, Brainerd & Co. In 1874, Richard T. Carroll bought out Brainerd’s interest and the firm was renamed Carroll R.T. & Co. They were located at 305 – 307 Front St. (in the heart of the S.F. wholesale liquor district) at this time. They moved to 328 Sansome in 1879 and remained there until 1882. The firm prospered and in 1882 R.T. decided to expand the business. He took on John Abrams and George L. Carroll (a relative; either brother or son of Richard) as partners in order to infuse more cash into the business. In 1882 they moved to 3 – 5 Front St., remaining there until 1887. The company was renamed Carroll, Abrams & Carroll, and remained so until 1887. In 1887 Abrams sold his interest to the two Carroll’s and the firm became Carroll & Carroll. In 1888 a move was made to 109 Front St., where they remained for one year. 1890 saw a move to 306 Market, where they remained until 1901, at which time they relocated to 120 Front St. The firm continued doing business as Carroll & Carroll until 1902, when they decided to call it quits; (good timing as the Great Earthquake and Fire of ’06 was on the horizon). The firm was sold to McDonald & Cohn in 1902, ending over a half century of presence in the S.F. wholesale liquor scene. 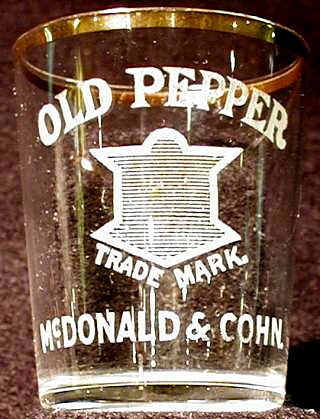 From what we know, based on existing labeled bottles, billheads and letterheads; their sole brand was "Old Pepper" whiskey. Pepper was purchased in bulk from the Jas. E. Pepper distillery located in Lexington, Kentucky. A total of three embossed molds were used over the years. One slug plate that was fairly non-descript, and two that are fairly ornate. All are scarce, with the slug plate (oldest) being the scarcest. Some of the Pepper Distillery variants (B-637) are quite crude and are early enough (ca. 1888 - 1905) to warrant the longstanding rumor of the existence of a glop top. This particular example has a notably crooked neck, is hammered with whittle, has color striations worthy of a post on the glop top site with the other "swirlys"at this time and appears to be days away from having an applied top. The other variant (B-638, dating ca. 1890 - 1902) is almost always neatly made but on rare occasions has been seen in colors approaching lollipop yellow. It too, is rumored to exist with an applied top. Oddly enough, Carroll Rye (which one would naturally associate with this company) was actually distributed by Louis Taussig & Co.; also a San Francisco firm that was in business from 1856 though 1918, when closed down by the Volstead Act and prohibition.